A breast ultrasound is a safe, painless procedure that uses high-frequency sound waves to produce pictures of the internal structures of your breast and axilla (armpit). It can be used to supplement mammography for patients with dense breast tissue or for diagnostic purposes. It can also be used as a screening tool for women who are pregnant or should not be exposed to x-rays (necessary for a mammogram). Dense breast tissue can make it harder for radiologists to find cancer on a mammogram since it can mask the appearance of tumors and may slightly increase your breast cancer risk. technologies has been proven to increase detection of breast cancer in women with dense breasts by up to 36% compared to using mammography alone. ABUS is a comfortable, quick exam. Your technologist will ask you to lie on the exam table and will apply a warm, water-based gel over your breast. A wide transducer will automatically scan your breast creating hundreds of 3-D breast tissue images. The full exam takes about 15 minutes and you should not feel any discomfort. 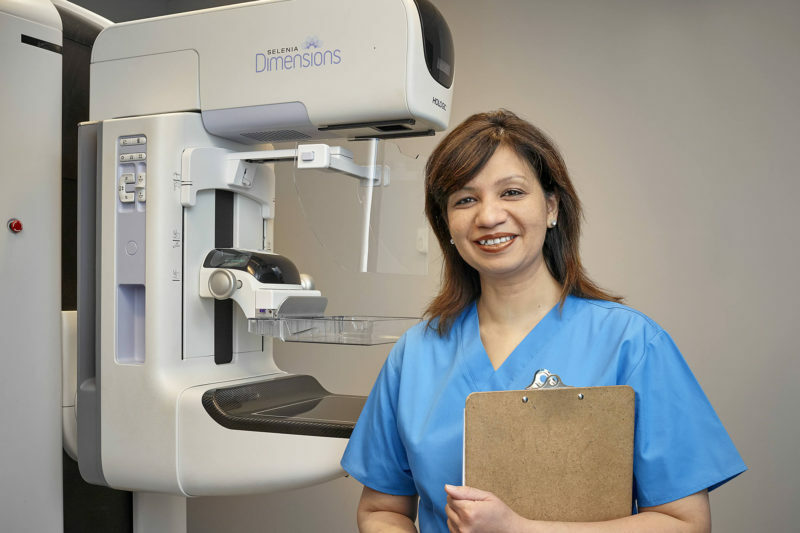 Following your screening mammogram, your radiologist or your healthcare practitioner may want to look more closely at a targeted area in your breast tissue with a diagnostic breast ultrasound. Your practitioner may also request a diagnostic ultrasound if you have a lump or you are having pain and tenderness that is not usual for you. During a diagnostic ultrasound exam, your technologist will place a warm, water-based gel directly on your skin and then use a small transducer or probe to pass over the area. The transducer transmits high-frequency sound waves through the gel into the body. The transducer collects the sounds that bounce back and a computer then uses those sound waves to create an image. You will be asked to remove your clothing from the waist up and to change into a gown. Your breast area will need to be visible for the exam. This allows our technologist to move the transducer around the entire breast and surrounding tissue, including the axilla (armpit) to provide the radiologist with a complete set of images. The radiologist will review the images and compare them to previous ultrasounds or mammograms. The radiologist will provide a complete report to your practitioner, usually within 24 hours.